Make the most of your summers with unforgettable family trips! The 2019 Gulf Stream BT Cruiser 5255 is a fantastic Gas Class C Motorhome, and you'll get a great deal on it with the sensational pricing at Tradewinds RV Center! We're Clio's full-service RV dealership, and one of the best in Michigan! Give us a call at 810-686-0710 to talk to our RV experts, or just come on down to our location at 4325 W Vienna Rd Clio Michigan 48420! The BT Cruiser 5255 is built with lots of living area. 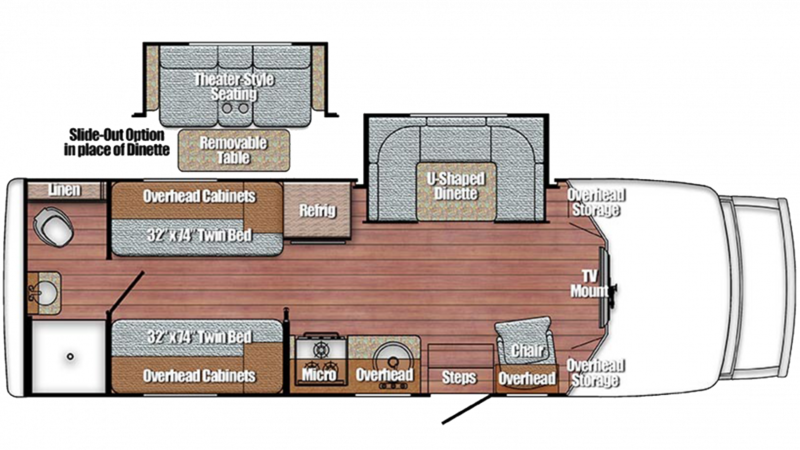 It's 28' 7" long and 8' 0" wide, and has 1 slides to maximize the interior space and comfort of this great RV! When it's cold outside, the efficient 25000 BTU furnace will keep everyone toasty and warm; and when the weather is sizzling hot, the modern 13500 BTU a/c unit will keep the temperature inside cool and fresh. Outdoor fun and adventures can work up an appetite! Satisfy your cravings by cooking up a delicious meal in the kitchen! Grab some fresh food from the 6.00 cu. ft. refrigerator and sizzle up savory treats on the 3 burner range cooktop! Before you leave home, fill up the 44 gallon freshwater tank for clean water throughout your trip!